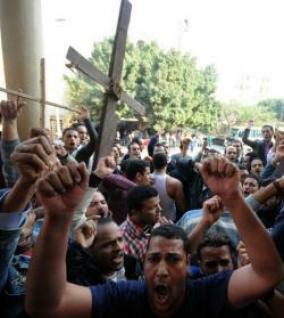 Crowds of Christian youth protested in the hundreds in Alexandria and Cairo on Sunday. The protesters in Alexandria were prevented by riot police from reaching the Saints Cathedral that had been bombed early Saturday morning, killing 21 and wounding almost 100. In Cairo in the Abbasiya neighborhood, the crowd gathered around St. Mark’s Cathedral, where dignitaries came to express their condolences to Pope Shenouda III, the spiritual leader of Egypt’s 7.2-million-strong Coptic Orthodox Church. Stone-throwing crowds injured some policemen. I used to live in Abbasiya when I was a graduate student in the 1970s, and remember conversations with Coptic Christian neighbors. The Arabic press reports that a string of notables went to visit Pope Shenouda, including the Rector of Al-Azhar seminary, Dr. Ahmad al-Tayyib, and several cabinet ministers. The rowdy protesters accosted them as they were leaving, pounding on their automobiles. At one point at least two cabinet members were trapped inside the cathedral for an hour and a half by the angry crowd. Riot police several lines deep eventually dispersed the crowd. The demonstrators demanded the resignation of Egypt’s minister of the interior (roughly analogous to US head of Homeland Security), as a matter of accountability, since his ministry should have prevented Saturday’s bombing. Al-Arabiya reports that the Islamic State of Iraq, a radical Sunni Arab group, had ordered the attack on the Saints Cathedral two weeks ago, and that they have a list of churches they want to target. Radical Sunnis in Iraq see Middle Eastern Christians as collaborators with external Christian Powers such as the United States, though this charge is based on a misconception. There has also been a controversy in Egypt over two wives of Coptic priests who felt abused and allegedly attempted to convert to Islam to escape their husbands, but were prevented from doing so by the Egyptian authorities. Radical Sunnis in Iraq and in Egypti were angered by the incident and sought revenge on the Coptic Christians. In the meantime, a tiff broke out between Pope Benedict XVI and the Rector of Al-Azhar Seminary, Dr. Ahmad al-Tayyib. The pope had called on world leaders to protect Egypt’s Christians. Al-Tayyib rejected that call as a form of meddling in Egypt’s internal affairs, though he repeated his vehement condemnation of the attack on Egyptian Christians. He asked why the pope had not call for international intervention in Iraq to stop the killing of Muslims there (presumably, he means, by US troops). The attack on Egypt’s Christians was denounced by a spokesman for the Muslim Brotherhood, Egypt’s now peaceful fundamentalist movement. He said that the attack had a negative impact on the lives of all Egyptians and called for the arrest of the perpetrators. The Muslim Brotherhood has a feud with al-Qaeda, which denounces the MB for not being violent or revolutionary. Then he ruined the whole thing by trying to blame Israel for the bombing. Lebanon’s Shiite Hizbullah condemned offered its condolences to the families of the victims. Iran, two, condemned the act of terrorism (Shiite Iran fears and hates hyper-Sunni al-Qaeda).